Hotels in Frankfurt come in all price brackets. 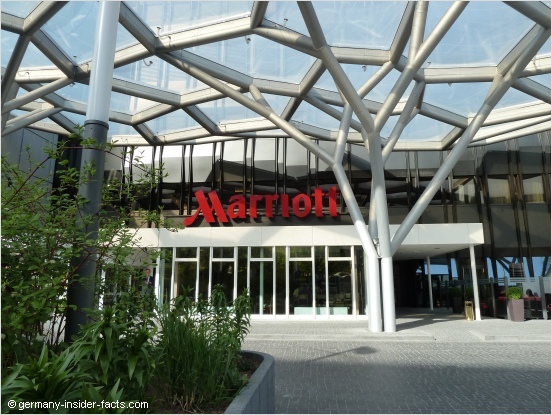 Being Germany's financial centre and a large transportation hub, it is no surprise that Frankfurt hotels cover a wide range of accommodation for business people and travellers. 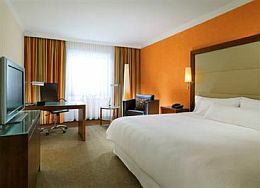 Conference hotels, luxury suites, middle class hotels, hostels and private rooms, you will find what you need in Frankfurt. Especially on weekends there are good deals for the best hotels. This is the time when business people have left the city and heaps of hotel rooms are available. 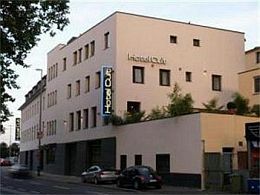 With this large choice of Frankfurt hotels it is usually no problem to find a hotel in Frankfurt. However, during major trade fairs and conventions it can become a next to impossible task to find accommodation. Prices rise and hotels are booked out months in advance. Offenbach, Hanau and the towns in the Taunus mountains are a good alternative at these times. 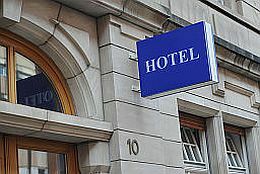 Many Frankfurt Hotels are in the Westend, the area around the fair grounds (Frankfurter Messe), near the main train station (Hauptbahnhof) and in the city centre. 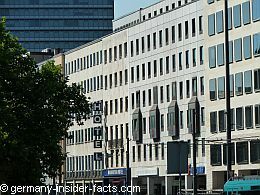 But there are hotels and guest houses in all districts of Frankfurt. As public transport is really good, it doesn't matter where you stay. 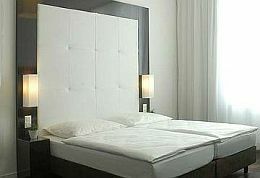 On this page you will find Frankfurt hotel recommendations in different price categories. Hotel tariffs vary widely depending on the time of your stay, the booking service you use and whether it is a last minute or early booking. So it really doesn't make sense to add prices to the hotel listings. Enjoy browsing through the hotel offers, or use the quicklinks to jump to a category. These hotels are in the upper price and service category and offer sheer luxury. However, you might be lucky to get a good bargain on weekends or when there are no fairs in Frankfurt. Without doubt, this is Frankfurt's most exclusive hotel. 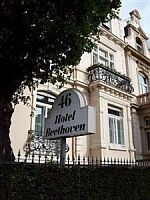 Situated in a beautiful 1904 villa in Sachsenhausen (extension buildings feature the same style), the hotel combines tradition and modernity in its 163 rooms and suites. Guests can relax in the nice inner courtyard and a large spa & wellness area. The superb service makes you feel at home instantly. Location: Sachsenhausen, just one block south of the river Main. Sachsenhausen's apple wine centre, bars, shopping areas and the museums along the river are within walking distance. From the nearby tram station the city centre is only minutes away. Not only a business hotel, but also a place to relax and enjoy the wellness centre and large pool. 342 recently renovated rooms and suites. Take advantage of special weekend packages. Pacific Colors Restaurant is open for breakfast, lunch and dinner. Sip a coffee or cocktail in the casual atmosphere of the Vista Bar & Lounge, or unwind with a drink in the American-style Gekko Bar at night. 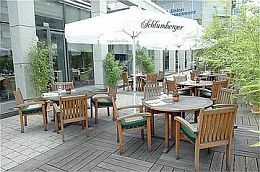 Location: Near Eschenheimer Turm in the heart of Frankfurt, close to shopping areas and the stock exchange. 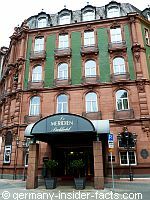 Whether you prefer the charme of a historic building, decorated in art nouveau style, or the technical comfort of a modern business hotel, you will find it all in the Le Meridien Parkhotel. The hotel offers 77 rooms and suites in the historical palace and 220 rooms in the business annex. Book the special art arrangement and get free entry to the Schirn Kunsthalle in Frankfurt. Restaurant Le Parc is open daily from 6:30am to 11pm, beergarden Le Jardin is open in summer months, depending on the weather, and Casablanca Bar is the ideal place to relax at night. Location: Just across the street of the southern exit of the main train station a short road leads to the charming Wiesenhüttenplatz. It is a quiet location despite being very central. Luxury and excellent service are awaiting you at the Westin Grand Hotel, a favourite place of business and leisure travellers alike. 371 newly renovated (2007) rooms and suites offer comfort in a warm and inviting ambience. A wellness-area, restaurants, bars and the Arabella lounge invite for relaxation after a long day of work, sightseeing or shopping. 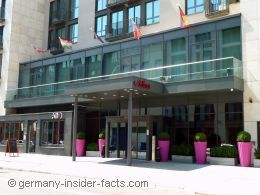 Location: Close to the Konstablerwache and the Zeil shopping mile. The old town is also easy to reach by a leisurely walk. Access to public transport is only 2 blocks away. 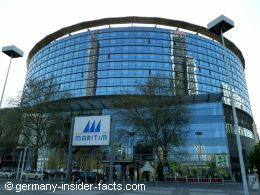 The hotel is connected with the Congress Centre and next to the city entrance of the trade fair grounds and the Messetower. 543 rooms and suites offer the usual modern standards and comfort. The SushiSho is supposed to be the best Japanese restaurant in Frankfurt. The Maritim Sports Club has a fitness section, pool and sauna. Luxury and excellent service for guests is the credo of the Hessischer Hof. 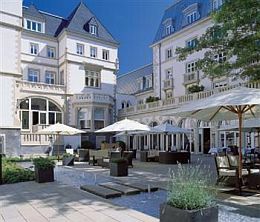 The hotel is Frankfurt's only privately run 5 star hotel and guests truly experience the difference. Free WLAN, free minibar, welcome drink in the hospitality suite each night are only a few extras included in the tariff of the 110 rooms and 7 junior suites. Location: Right across the road of the fair grounds (Frankfurter Messe), a little more than 1km from the city centre and the train station. Do you like pure white? Unique design? Then the Pure is the right place for you. Situated in a 19th century loft, guests find an atmosphere of open spaces, transparency and freedom within the public areas and the individual 50 rooms. Location: One block north of the main train station, close to the fair grounds. The city centre is also not far away and can be reached by public transport within minutes. Opened in 2009, this fairly new apartment hotel offers studio rooms with kitchenettes, one and two bedroom apartments with kitchen and laundry. A swimming pool and fitness area and the restaurant Alto belong to the complex. This is a great place to stay for a couple of days in Frankurt. Location: Only one block from the river Main and the new opera house, most Frankfurt attractions are within walking distance. As everywhere in Frankfurt, stops for public transport are not far away. 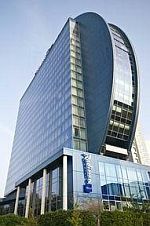 The coin-shaped design of the Radisson Blue hotel is unique in Europe. Inside the hotel also features unconventional and classic decoration. There are four different themes for the 428 rooms. Guests can choose from "at home", "fresh", "chic" or "fashion", all themes are available throughout the room/price categories. The large windows offer stunning views over the city centre or to the Taunus mountains. Location: The Radisson Blu is not really close to the city, so this might be a disadvantage for those guests on a leisure trip. However, there is a tram station close to the hotel. Tram #17 takes you to the Messe (trade grounds) and to the main train station. As a certified organic hotel all rooms in the Villa Orange are individually decorated with warm-coloured materials and wooden furniture. Bathrooms are equipped with natural care products, bedding is made from organic cotton, and the breakfast is organic. The 38 rooms have free wireless LAN, tea & coffee facilites, hair-dryers, air-conditioning. A great little owner-operated hotel with an individual touch. Location: In a quiet residential area in Frankfurt's Nordend, only 200m from a U-Bahn station, the hotel is a good place to unwind. 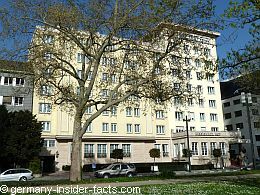 The Intercontinental Hotel in Frankfurt was the first hotel of that brand built in Europe. 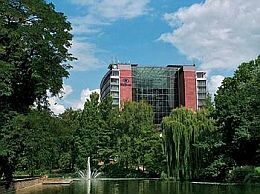 The Frankfurt Intercontinental is still the largest business and convention hotel in the city. 770 rooms on 21 floors, guests can choose to stay in the city wing or river wing. You will get stunning views wherever you stay. The Signatures Veranda Restaurant offers delicious German specialties while the Leons has tasteful Italian cuisine. Location: The hotel is on the river Main, not too far from the train station. A short walk across Holbeinsteg brings you to Frankfurt's famous Museumsufer. The city centre and the Messe can be reached by tram from the station within minutes. Living in perfect harmony is the slogan of this owner-operated hotel. It is a favourite hotel that books out quickly. Facilities include 145 modern, spacious rooms, a bar that is open from 6am to 4am, Thursdays to Saturdays even longer. During summer guests can relax in the summer lounge. Location: Next to the northern exit of the train station. The city centre and trade grounds are within walking distance, or can be easily reached by tram. 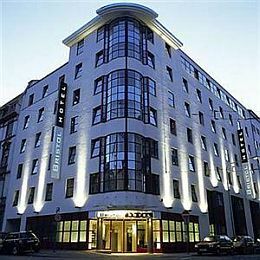 "I stayed in the Bristol Hotel when I last visited Frankfurt. 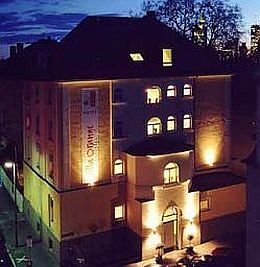 It's a young, fun hotel that's very close to the Hauptbahnhof - about a three minute walk away. I thought that the hotel was brilliant value for money. The rooms are clean and modern, with stylish bathrooms and fluffy towels. Perhaps the rooms are a little compact, but that's quite common in Germany! The highlight of the hotel is the amazing breakfast. It's served up until 1pm on the weekends, and really is a 5* selection. It includes smoked salmon, exotic fruits, home-made yogurt, fresh pastries, and even glasses of sparkling wine and shots of vodka, if you'd like them! There's a modern, fun bar at the front of the hotel which is quite lively at weekends. There's also a large outdoor garden, where you can eat breakfast in the morning, or drink cocktails in the evening." This review was sent in by Edd Morries from the UK. Thank you Edd. This family operated hotel is a gem. Situated in a renovated old villa, all rooms are individually designed. Personal and friendly service by a dedicated team. Breakfast buffet and wireless LAN are included in the price. 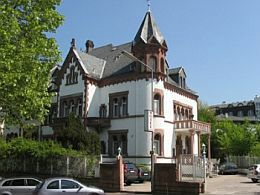 Location: Westend, a quiet and safe residential area, close to the Senckenbergmuseum and Palmengarten. The trade fairs grounds (Messegelände) can be reached on a short walk. Initially this was a hotel for artists, but it became a favourite hotel for tourists and business travellers as well. 26 large rooms with wooden floors, high ceilings and simple, classy furniture invite visitors in this old villa. Some rooms have their own bathroom, some rooms share a bathroom with a second room. There is a billiard room and a roof garden with beautiful views. Location: Bahnhofsviertel, just two blocks east of the station, close to Kaiserstraße and the city centre. This is another hotel for those who prefer charme over the uniform style of the large hotel chains. The hotel has a wide variety of rooms, from XXL to small. Some rooms have shared facilities. Baby beds are free of charge, additional beds (in the parents room) for kids up to the age of 14 cost a small fee. With a nice little garden the hotel is a great place for families. Location: Sachsenhausen, only a short walk from the southern railway station and the heart of Sachsenhausen. Located in a pedestrian mall right across the Paulskirche this small 3 star hotel is perfect to explore the heart of the old town in Frankfurt. Reasonable prices, breakfast included, the friendly staff will help you to have a pleasant stay. The Manhattan has 54 rooms with free WLAN, minibar, TV and desks. Hotel services include internet terminal in the lobby, laundry service, breakfast buffet, the bar is open 24 hours. 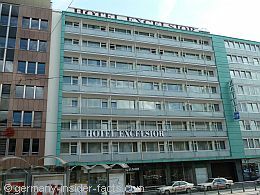 Location: Across the main train station (exit north), on the road leading to the Messe, this is a convenient location. Modern hotel garni with 69 comfortable rooms at a reasonable price. Breakfast, WLAN and Pay-TV is included in the rate. A terrace, bar and sauna offer the recreation guests need. Location: In the south-east of Sachsenhausen, close to the famous apple wine district, good S-Bahn and tram connections to the city. 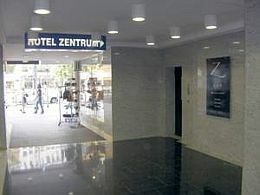 Hotel rooms at the Zentrum have everything a budget-conscious traveller is looking for: bathroom, TV, free WLAN, sound-proof windows, and breakfast included in the price. 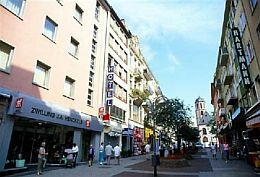 Excellent location in the city centre right across the Hauptwache. The Zeil shopping mall, the old town, stock exchange and other city attractions are really close. Not a beauty from the outside, the Excelsior has great offers for travellers. All 196 rooms have free minibar and free WLAN. Guests can use the hotel's business centre with pc, printer and internet access. Refreshments are available in the lobby during the day. Location: Right across the southern exit of the main train station.